Selina’s diagnosis of Crohn’s disease was a little out of the ordinary. She remained symptom-free throughout her teens, and her years of study in the Theatre for Development program at Concordia University. She was mostly symptom-free throughout her work in Montreal, where she honed her skills as a jazz singer, theatre practitioner, and general arts admin/bartending specialist. She didn’t think twice when crippling pains nearly prevented her from going on stage at festivals with her band, with crowds of 500-2000 people waiting to hear them, she found a way to push through the pain, and the show went on. Something was wrong, she just didn’t know what. So she returned home to Kingston, where she found herself battling what she had thought was a serious depression and a period of “spotty” health. But after being told that anxiety must have caused her pains, and overlooking the occasional blood that appeared where it shouldn’t, she decided to take the road less travelled. She took off to Australia on a one-way ticket. In order to catch her flight, Selina had to cancel the scheduled colonoscopy that she had been waiting months for, but she decided it would be well worth the risk. Once in Australia, her symptoms of depression and her difficulties with her health seemed to lessen. She was exercising more, surfing, biking, and swimming in the ocean. She had stopped eating wheat because of her roommates’ intolerances, and these changes made all the difference in her health. But after travelling the world for a while she decided to make Paris, France, her home. That new home came with a lot of changes, changes that did not agree with her body, and those changes started to take shape in her everyday life. Her weight dropped off. “That’s the French diet,” her friends said. But Selina knew something wasn’t right. Eventually, she was weakened to the point where she could no longer walk more than a block from her house. After some hit or miss experiences with doctors, she found a physician willing to do the right tests, tests that showed she had no potassium left in her system, which meant that her heart was on the brink of shutting down. She went straight into hospital, her Crohn’s disease had prevented her from absorbing much of anything anymore and her multiple daily bathroom trips had made the little potassium she had, flush out of her system. Her lack of a support system and people that knew her well meant that no one was there to warn her just how much weight she had lost and her fierce independent spirit had urged her through the kind of pain no one should endure without seeking serious medical assistance. After two weeks of semi-consciousness in a hospital in the North of Paris, Selina began to realize what had happened. It took a month to get a final diagnosis of Crohn’s disease. Two months later, she was released from hospital on a heavy rotation of immunosuppressants, corticosteroids, antibiotics, and biologics designed to get her back on track. She managed to sidestep surgery through her heavily medicated regime, and she put the steroids to use by swimming, practicing Aikido, working out regularly, and performing in local venues as a singer-songwriter and jazzy chanteuse. Fast forward a decade or so, a diet or several, a country or two, plus the addition of a Belgian husband and two beautiful children to her life, and Selina’s existence has settled to a hometown remission. Kingston has proven to be a supportive, nurturing community surrounded by friends and loved ones from what seems like a lifetime ago. Although navigating her way through a Canadian health system has proven difficult at times, she knows her disease better, can advocate for herself, and she is finally on a stable path. A path tended to and maintained by biologics, climbing, pursuing her career as a storyteller, writer, and singer, and being involved with wonderful groups such as Crohn’s and Colitis Canada and female-forward initiatives. 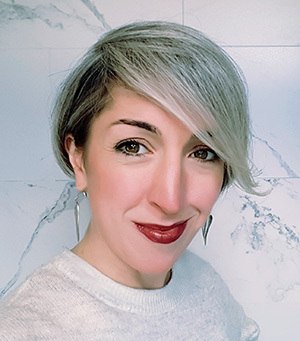 Selina is delighted to be this year’s Kingston Gutsy Walk Honorary Chair and invites everyone affected by Crohn’s or colitis to gather a team of friends, family or co-workers and join her at Lake Ontario Park on Sunday, June 2nd.